Every few months Pilates Authentica will spotlight a client. They will share their story of how they came to know and love Pilates. Debra has been my client since 2009. I asked her if she would be willing to share her story and she graciously agreed. In September 2002, the car that my husband and I were traveling in was struck from behind by a street-racer. The impact propelled our car into the highway median where it flipped end-over-end four complete rotations. As a result, the roof of the car collapsed down onto me and I received a traumatic brain injury and fractured my C1 cervical vertebrae. When I awoke from a drug-induced coma several days later, things that I had learned years before and took for granted such as walking and keyboarding were gone. With traumatic brain injuries, doctors cannot predict what abilities a patient will regain, thus began a very long journey of treatment, physical therapy, prayer, and sheer strength of determination to regain my life. Although I learned to walk again I continued to have balance issues, and started having dizzy spells and falling down stairways. Testing determined that there was a delay between what my eyes saw visually and the message transmission to my brain. Additional physical therapy helped my brain to make new neuron connections, medications, and the passage of time allowed my brain to continue to heal. My doctor told me that the neuron connections in my brain that had been broken would not repair themselves, but that I would need to continue to challenge my brain in order make new connections. As time passed and I was looking for new ways to challenge my brain and improve my balance, I asked my doctor about trying yoga or Pilates. My doctor was very enthusiastic about both. In the fall of 2008, I met a friend at a social event and her enthusiasm for Pilates was evident. I knew that I wanted to begin taking Pilates lessons. Cecilia has been my Pilates instructor since August 2009. She has patiently worked with me every step of the way to help me overcome the physical weaknesses that resulted from our wreck. My brain injury was to my right frontal lobe and I have continued to have muscle weakness and coordination issues with my left arm and leg. 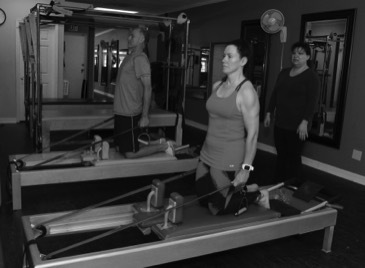 About 6 months after starting Pilates training not only did I reap the benefits with changes in my physique, but I strengthened and improved the coordination of my left arm and leg. Cecilia continues to challenge me physically with advanced Pilates moves. While the physical changes have been wonderful, I am most happy about the improvements Pilates has made in my life by challenging my brain. This is evident in my increased endurance throughout an average day, my improved balance and coordination, and even in the gait of my walking. I am a true believer in the benefits that Pilates can make to one's life and plan to continue Pilates for the rest of my life. Everybody can do Pilates, but Pilates is not the same for Every Body.